I love baseball! I have been a San Francisco Giants fan my entire life, I was born into a family of Giants fans, so I didn’t have much of a choice! Today the Giants had their season opener against their arch-rivals the Los Angeles Dodgers. 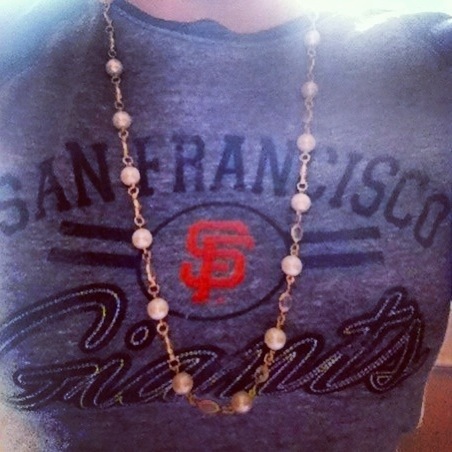 To show my support, I had to wear some of my Giants gear today. Ladies SF Giants baseball t-shirt $16 Target, bought two years ago. Women’s clothing for professional sports teams has become very popular in the last few years. I am shocked at how expensive it can be. Depending on your size, check out the boy’s department if you are a sports fan and don’t feel like paying the “adult” full price. Dark Hudson Jeans $79 Nordstrom Rack. 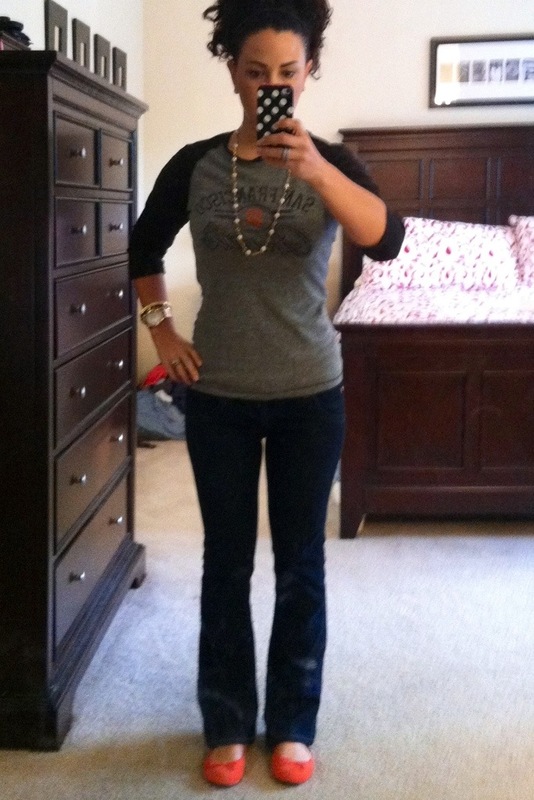 I cannot even begin to tell you how amazing Hudson Jeans are! The fit is fabulous, they keep their shape, and don’t stretch out! One tip for denim is to not wash them after every time you wear them. This breaks down the denim and fades your jeans. If you are worried about fading or shrinking, wash your jeans on cold and don’t put them in the dryer. Gold pearl and crystal necklace free from my grandma. I like to wear girly accessories with sporty clothes. There aren’t any rules as far as I’m concerned about what you can or can’t wear! I also wore some stacked gold bracelets with my rose gold watch and my adorable gold pave post earrings. Orange ballet flats $9.99 Target. 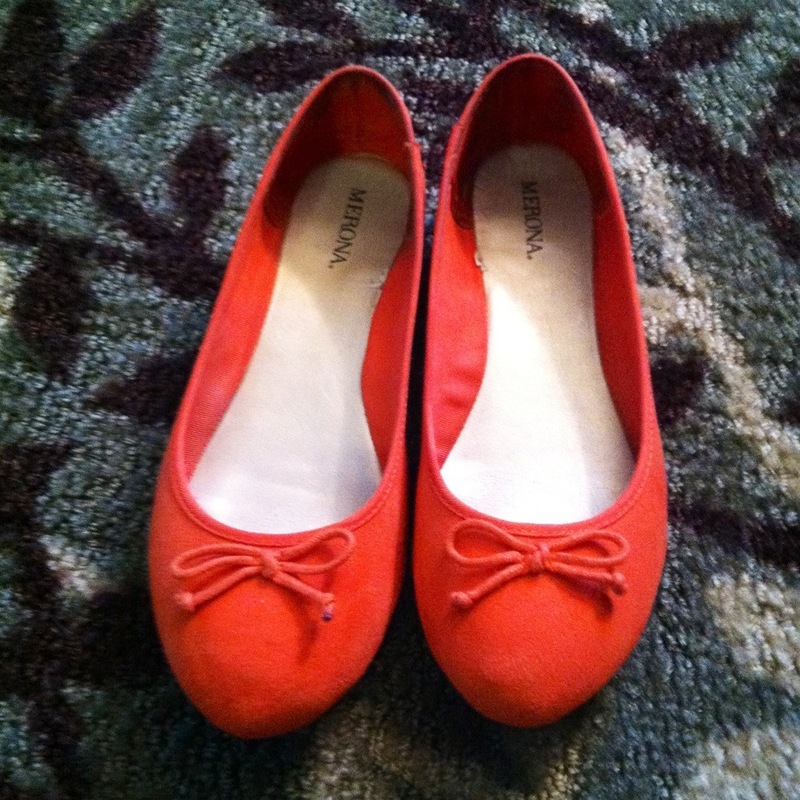 Since the Giants’ colors are black and orange, I had to wear my orange ballet flats with the cute bows! These could be the most comfortable pair of flats I own! I love the color and wear these year round! Sadly, the G-Men lost today. When the Giants lose to the Dodgers it is the worst kind of loss. They play them again tomorrow, so hopefully the Giants will win! Happy Monday and Go Giants! GOOOO GIANTS!! I was on BananaRepublic’s website and they have the SAME orange flats retailing at $98.00. Way to go MFFL!! Wow! That is amazing, I can’t imagine spending $89 for a pair of flats, well maybe if they were Tory Burch!